At Bristol Wireless we’ve been using LTSP* (Linux Terminal Server Project) since we were founded in 2002. We’ve always found it to be very reliable both for running our lab in Bristol, as well as providing public access/training suites in both fixed locations and for temporary/mobile ICT for events. LTSP is a client/server based computer system allowing multiple users simultaneous access to the same machine. Linux is a free operating system that also come complete with a free office suite, web browsers and media players, etc., and can run applications from Linux and Windows servers. The system runs on a single server, such that routine maintenance, backups and updates of the LTSP server can be carried out remotely. LTSP thin clients contain no moving parts, hard drives, optical drives, etc. and have only minimal memory, meaning that thin clients are quieter than conventional desktop PCs and consume considerably less power, further reducing costs, an important factor to consider when looking at ‘greening’ ICT to make it more environmentally friendly. LTSP is a flexible, efficient platform that’s enabling schools, businesses and organisations of all kinds all over the world to install and deploy open source desktop workstations easily. Thin clients (also known as terminals) can be bespoke shiny new units or refurbished legacy PCs and may be used for conventional tasks: to browse the web, send email, create documents, graphics and run other desktop applications. LTSP not only improves Total Cost of Ownership (TCO), but more importantly provides increased value over traditional computing solutions. A public access LTSP thin client in a secure cabinet at Easton Community Centre Linux thin clients have proved to be extremely reliable because they’re tamper-proof (ideal for public access suites) and Linux is a very secure, stable operating system. Various real world scenarios exist where LTSP has been running continuously for a number of years without serious problems. One example is Easton Community Centre. The original project entailed the installation of seven LTSP workstations for public use in the foyer of Easton Community Centre in Kilburn Street, Easton, Bristol. 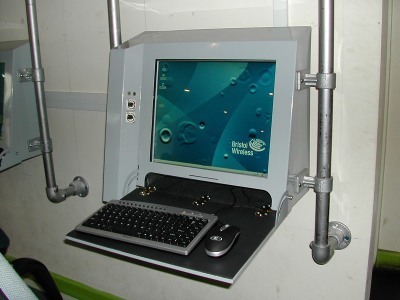 In keeping with our green credentials, this project used donated Compaq workstations originally used as desktops by the National Health Service for the thin clients. A Dell server was chosen to run the suite and all the user applications. It proved to be both very low-powered and very efficient. This installation has since been updated courtesy of grant funding with bespoke thin clients being housed in robust, tamper-proof custom cases designed by Bristol Wireless. These systems have proved to be very reliable: they run in what’s known as kiosk mode; this means that when the user closes the web browser all history is lost and any user data stored in the home directories is also cleared when the terminals are turned off. LTSP is distributed under Version 2 of the GNU General Public License (GPL), meaning it’s free of licensing fees and always will be. Please contact us for more information on LTSP or to arrange a demonstration. Alternatively, download our non-technical LTSP leaflet. This entry was posted in Linux & Free Software.